Protocol: How Control Exists After Decentralization – Angel Daniel Matos, Ph.D.
Alexander R. Galloway’s Protocol: How Control Exists After Decentralization is by far one of the most exciting and challenging readings that I have encountered in a long time. In essence, it is a book on issues within the realm of computer science targeted towards individuals who have little or no experience within the field. By focusing his attention on the “institutional ecology” of modern computing, Galloway strives to offer a compelling and insightful look at the aspects of form, structure, and materiality within contemporary technology via the discussion of protocols, which in essence are logical rules (or arguably, formats or templates) of control that govern the exchange of data or information across a network. In due course, Galloway exposes how protocols and the advent of decentralized or distributional networks has shifted how notions such as power and control manifest in society (alluding to Foulcaldian and Deleuzian frameworks), and how their existence creates a paradoxical tension between institutionalization/fixation and freedom/deterritorialization. Although many of the concepts, ideas, and terminology discussed in this book may seem daunting and baffling to people who don’t have much experience with computer programming, Galloway illustrates complicated concepts using various heuristic aids and metaphors (his depiction of interstate highways and airports to explain how decentralized networks function was particularly illuminating). I also found his application of Marxist, Deleuzian, and Foucauldian theories to be compelling, and it really surprised that this application helped me to better understand concepts that have been fuzzy and inaccessible to me in the past. His discussion of Foucault’s notion of biopower was particularly accessible when applied to protocols, and how they have helped transition control from a centralized presence ruled by physical and violent tendencies into a dispersed and abstract manifestation ruled by information, statistics, and quantitative data. Given the rapidly changing nature of computer science and technology in general, it should come to no surprise that some of Galloway’s arguments and illustrative examples might seem dated and incorrect (after all, the book was published eight years ago). For instance, at one point Galloway posits that the corporate battles over video formats are moot with the presence of DVD, a format adopted according to a consensus among leaders in the film industry. Nonetheless, shortly after the publication of this book we witnessed the battle between the BluRay video format (led primarily by Sony and their integration of this technology into the Playstation 3) and the now defunct HD DVD format. Not only does this demonstrate the circularity existent within the adoption of modern technology, but it also goes to challenge some of Galloway’s assumptions of how technical standards are determined in contemporary society. 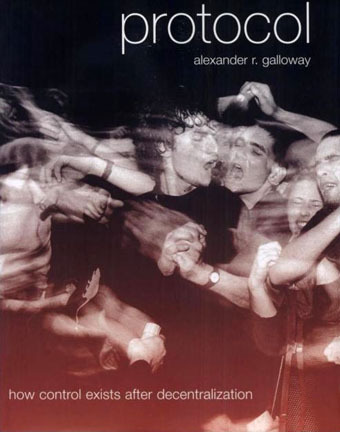 Nevertheless, Galloway’s text is definitely illuminating in terms of depicting the idiosyncrasies of protocols and their formal material and social qualities, which in turn will pave the way towards better criticism of technologies, ideas, and networks that are governed by protocological standards. What immediately came to my mind was whether or not there are non-computational phenomena or manifestations that follow protocological guidelines. For instance, in my past studies in linguistics, language was usually approached as a centralized phenomenon regulated by core apparatuses (universal grammar, broca’s area, etc.). But, how do we explain language production in the case of children who undergo hemispherectomies, and still possess the ability to speak and decode language even when entire parts of the brain are removed? Is it possible that language acquisition, similar to the internet, is also based on decentralized protocological networks? Are there areas within literature and the arts that are also guided by structures and formats similar to protocols? The possibilities are indeed tantalizing.